The new law requires nearly half a million jobless Belarusians who did not pay taxes for more than six months, to pay an annual fee of approximately $245 (as of January 1, 2017). This fee is quite high, particularly for a jobless person, considering the average monthly salary in Belarus is roughly $380. Those listed as officially unemployed are exempt from the decree, as they must do work on behalf of the state to receive their benefits (such as street cleaning). Over the past two months, as the tax has come due, resistance to the decree has grown from small critiques and online chatter, to public discussions organised by the democratic political opposition and the authorities, to public protests in Minsk and the regions. This resistance appears genuinely broad based and domestic in nature. As of the end of February, at least ten protests have occurred across the country with total participation estimated at nearly 9,000. Some of these protests have been organised by the democratic opposition, while others have been self-organised by citizens. Frustration with the parasite tax has served to awaken public interest in political life. It also creates a rare opportunity for democratic parties and movements to connect with ordinary people on a large scale. Elements of the democratic opposition have long been opposed to the decree. Their efforts to connect with and organise citizens frustrated with Decree No. 3 demonstrates the opposition’s growing capacity to look beyond a protest only approach. Instead, opposition parties and movements have sought opportunities to facilitate public conversations, demonstrate their responsiveness and relevance to citizens affected by the decree, and to engage authorities on behalf of the citizenry at public meetings. In the short term, it seems organised efforts to oppose the decree, public frustration, and opportunities to engage people in civic-political action will grow. The Belarusian authorities have taken note of the dissatisfaction. While unlikely to overtly abandon the decree in the face of opposition, they have begun efforts to mitigate negative perceptions through nuanced public engagement efforts of their own. The authorities have thus far pursued a public relations strategy to defend the decree and emphasise that the Presidential administration will implement it fairly. This public relations defence on state media and at “citizen receptions” organised by the presidential administration has been coupled with targeted pressure against local activists, largely in the form of hefty fines for participating in unsanctioned rallies. The number of activists facing charges still remains low, but these kinds of stifling measures may grow if protests continue. President Lukashenka’s Decree No. 3 was criticised by democratic parties, human rights organisations, independent unions and the International Labor Organisation (ILO) immediately after it was signed in 2015. The decree and its critics were largely ignored by the broader public until recently. Public interest in the decree began to increase in late 2016 and early 2017 as citizens began receiving notices that they were subject to the social parasite tax. Ultimately, over 470,000 people (approximately 10 percent of the working age population) were told they are subject to the parasite tax. As of February 2017, 54,000 people have paid the fee amounting to a total of 16.3 million rubles (approx. 8.69 million US dollars). As the number of Belarusians receiving parasite tax notices increased and the payment deadline of February 20, 2017, approached, popular interest and outrage regarding the decree grew. Increasing dissatisfaction with the decree has also been fuelled by a sharp decline in Belarusian income over the past two years (-7.3 percent in 2016, -5.9 percent in 2015). As frustrations have grown, long time advocates against the decree found new audiences for their critiques and ordinary citizens took to social networks and video blogs to express their opposition to the idleness decree. Anti-decree petitions were the first form of organised opposition. In January and February 2017, activists from the Belarusian Radio and Electronics Workers’ Union (REP), United Civil Party (UCP), Belarusian Christian Democracy (BCD), and the For Freedom Movement (FFM) collected 75,000 signatures against the parasite tax. Over 25,000 of the signatures were collected via the online petition platform Zvarot.by. Public hearings and discussions on the decree were organised in Minsk and a variety of Belarusian regions by FFM, REP, Belarus Social Democratic Party Hramada (BSDP-H), and Tell the Truth (TTT). During some of the hearings, legal assistance was offered to those subjected to the parasite tax. For example, during TTT hearings, activists helped affected citizens to file individual appeals to parliament and the President. Legal tutorials were also organised online by several organisations and individuals. In late January, several opposition organisations called for protests to advocate for repealing the idleness decree. The first protest, the “March of Angry Belarusians,” was organised in Minsk by REP and Mikalaj Statkievič’s Belarusian National Congress on 17 February. The unsanctioned rally attracted over 2,000 people, exceeding most expectations. Significantly, the majority of those in attendance were not part of the opposition movements, but ordinary citizens attracted to the event because of their personal antipathy to the idleness decree. The divide between the event’s organisers and audience was evident by the audiences muted response to speeches and chants that veered away from the idleness decree and towards political and personal critiques of the president. The protest was covered by the Belarusian independent media, foreign media, and, surprisingly, Belarusian state media. Live broadcasts of Belarusian independent media gained approximately 1,000,000 views within a day of the rally. 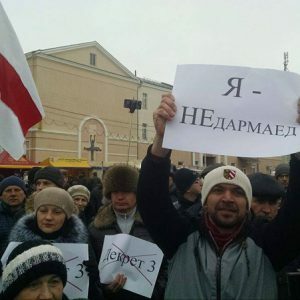 Two days later, on 19 February, UCP, BCD and other political forces organised a series of protests against the decree in Homiel, Mahilioŭ, Viciebsk, Brest, and Hrodna. Over three thousand people are estimated to have participated in these regional events. A week later, on February 26, protests continued as four more rallies against the decree were organised in Viciebsk, Babrujsk, Baranavičy, and Brest. It is noteworthy that protests in Viciebsk and Brest were mostly self-organised through social network groups (e.g. Typical Viciebsk or Parasites of Brest on Vkontakte). At the same time, Babrujsk and Baranavičy rallies were headed by BCD and UCP leaders correspondingly. Over three thousand people are estimated to have participated in 26 February protests. In Babrujsk, another young man demanded that a local road repair project should be supervised and accepted not by officials but city residents. Another young man blamed members of parliament for “not lobbying the interests of Baranavičy and its citizens to attract foreign investments to the city.” Public speeches at the events are as likely to include frustrated citizens as they are opposition activists. In Viciebsk, for instance, one of the social media stars of the event was a 38 year old janitor of a local kindergarten nick-named the “Viciebsk Joan of Arc” by the independent media. This was her first time at a protest and in her remarks she said the people are tired of living as they do now and that the authorities enjoy luxurious life while people suffer injustice. Regional rallies will continue between now and the end of March in Brest, Pinsk, Babrujsk, Mahilioŭ, Viciebsk, Hrodna, Orša, Maladechna, Homiel, and other regional cities. On 15 March, UCP, BCD, BSDP-H, the Green Party, Fair World, FFM and others are planning to hold a protest in Minsk, which will coincide with Constitution Day. Opposition organisations are also poised to continue promoting the abolishment of the idleness decree by organising public meetings and, legal consultations, as well as through an ongoing dialogue on social media. The Belarusian government has positioned the decree as an effort to punish those who are hiding their money and failing to contribute to society. Given the wide array of people impacted by the decree and the deteriorating economic situation, these arguments have not been received well. In late 2016 and early 2017, when discontent was largely online, the Belarusian authorities rejected the idea of abolishing the decree, but did amend the list of those affected. For example, members of national sports teams, men completing alternative military service, and people living in difficult circumstances were excluded from the decree. The vague concept of difficult circumstances gives the government great flexibility when interpreting the law, thus allowing them to show and promote their clemency in individual cases. As public dissatisfaction over the idleness decree increased, the President made the unprecedented move of ordering senior members of the Presidential Administration to hold citizen receptions. Such events have been held over the course of the past week and are likely to continue in the coming weeks. The public greeted these citizen receptions with interest. Opposition political activists attended some of the receptions, and a number of them used to broadcast the meeting live, or their gave their impressions afterwards. The receptions were covered on state TV and utilised by the authorities to demonstrate the presidential administration’s closeness to the people, and their willingness to listen and solve problems. State media covered the February 17 protest against the decree. The authorities’ citizen receptions, comments of government officials, and active state news coverage of events surrounding the idleness decree point to a three-pronged public relations strategy. The authorities are simultaneously defending the law, demonstrating flexibility in its implementation, and presenting the presidential administration as responsive to citizen concerns. This public campaign also credits the president’s representatives with reining in overzealous local officials. For example, the coverage on “Belarus 1” highlighted situations in which fines were rescinded after the presiding official of the presidential administration determined the tax had been applied “unfairly” by local officials. The governmental response to public protests has also included targeted pressure against activists. None of the previously scheduled rallies or upcoming events have been officially authorised. Some events were held without requesting permission and others were held despite official denial. The police did not disrupt events. Following the rallies, however, local police opened investigations on at least two opposition leaders from BCD and a number of democratic activists from Mahilioŭ, Viciebsk, Hrodna and Homiel. What is most notable about the public receptions, official commentary, and TV coverage is that the authorities felt the need to actively engage with citizens and take an assertive media posture to defend themselves and the decree. The implementation of this decree seems to have hit a nerve in society that the authorities recognise and hope to calm. If the presidential administration sees its “citizen receptions” as useful, perhaps such events will become a regular part of the authorities’ tension reduction tool box. This would create a new opportunity for citizens and social-political activists to engage and pressure the authorities to increase their responsiveness. Given that the authorities, including Lukashenka, have stood behind the decree for the past two years it is unlikely that they will fully abandon it regardless of how unpopular it is. Whatever the original purpose behind the decree or its actual value, at this stage to cancel the decree in the face of public opposition could be interpreted as a sign of weakness and a victory for civil society and the political opposition. In the short term, it is likely the authorities will continue to defend the decree as a means of fighting tax evasion, along with promoting the fairness of the appeals process for those who believe they are exempt. They may continue to use citizen receptions and other outreach to improve public perception of the law. This communications approach drives a public perception wedge between “bad” parasites who remain subject to the decree and the “good” victims subjected to this through the failure of the local authorities, but saved by the long arm of the president. Outside of the public eye, the authorities are likely to continue to demand payment of fees, but may do so carefully and with an eye toward avoiding controversy or protest. It is worth noting that the authorities have limited capacity to punish or persuade over 400,000 people. Should this approach work, the protest mood in the general public may dissipate if the population begins to perceive the president as a fair arbiter of the situation. Should public discontent grow, however, and manifest itself in increasing street activism, it is likely the authorities would further increase the risk of public participation by expanding their targeted repressive measures. Based on the government’s response to protests against the idleness decree thus far, and their approach to unauthorised gatherings over the past two years, the most likely form of pressure would be levying of fines on individuals participating in protests. A fine of a few hundred dollars, often exceeding the average monthly salary in Belarus, can significantly reduce an individual’s interest in public participation, while also bypassing significant international media attention. If further escalation is required, past precedent suggests certain activists and their families will be targeted and threatened with loss of employment or other very personal and impactful consequences. While a violent crackdown on protesters is always an option, it is unlikely the authorities would take this route, except as a last resort in the face of a truly unanticipated level of protest. A violent crackdown would undermine the authorities’ efforts to engage with western nations, and it would isolate Belarus at a time of a major dispute with Russia. The widespread disapproval of this decree is bridging a long-standing gap between broad public concerns and what is perceived to be the agenda of the organised opposition. Regardless the actions of the Belarusian authorities, opposition to the decree is unlikely to stop in the short term (at least not before the March 15 rally in Minsk, and potentially beyond). There will be continued efforts, including by established opposition forces and politically unaffiliated activists, to collect signatures, hold public hearings, and mobilise people for new organised protests in Minsk and in the regions. The challenge for the authorities is that the idleness decree is a long term issue. While the strategies described above may be help to weather the current wave of discontent, within the next six months a new batch of parasite notices are scheduled to be sent out and this whole process may start again. Abandoning the decree in the face of protest seems unlikely, but perhaps once things have settled down the long term approach could be to quietly cancel, or simply stop implementing the decree. This would save short term face and remove a potential long term public irritant. Only time will reveal the government’s strategy related to the idleness decree or the long term implications of the movement against it. For the moment, we can say that the engagement and activism of society and opposition against the parasite tax shows political life yet lives in Belarus, and the president has taken notice. Aliena Arciomienka, BISS, analyses the impact of the crisis on the potential of street protest in Belarus. Thomas De Waal, Carnegie Europe, suggests Lukashenka’s balancing act is made easier by the confusion coming from the White House as to what constitutes current U.S. foreign policy. High basic civic knowledge, low trust in influencing government – Pact presents key results of the Civic Literacy Test survey in Belarus. Aliaksandr Klaskoŭski reflects on a meeting between Lukashenka and chief editor of Narodnaja Volia independent newspaper. The new papers added to Belaruspolicy.com database include a study of the Belarusian High Technology Park, joint stock companies, and the 8th issue of the Macroeconomic Review of Belarus. This and more in the new edition of digest of Belarus analytics. New Quality of Protest. Why Belarusians Began to Take Streets – Artiom Shraibman, for the Carnegie Moscow Center, writes about the protests against the “social parasite tax.” People were brought to the streets due to a mixture of two emotions – they feel that they have nothing to lose and nothing to fear. This is a new quality of protest for Belarus when the passive majority is sympathetic not to the president but the protesters. What Do the Protests in Belarus Mean? – Yauheni Preiherman, for the Jamestown Foundation, analyzes a series of protests in Minsk and regional cities in recent weeks that made headlines both inside Belarus and abroad. The fact that they gathered the largest number of protesters in almost seven years sparked active discussions as to whether the protests can become a game-changer for Belarusian domestic politics and the country’s role in regional affairs. Impact Of the Crisis On Protest Potential of Unemployed – Aliena Arciomienka, BISS, analyzing the recent protests against the decree №3, draws attention to the polls on the Belarusians' attitude to reforms. From 2014 to 2015, the number of unemployed Belarusian ready to participate in rallies raised from 4% to 23%. Such protest potential is growing not constrained by any fear of job loss or deterioration of labour conditions or the lack of support from the state. Why Belarusian Business Supports Social Projects – Aliaksandr Skraboŭski, head of the National contest Social Weekend, explains who and why social projects. One of the answers is that Belarusian business wants to reflect the degree of their maturity, their owners, employees, and thank the environment for the opportunity to run the business. Soon such intangible assets will remain almost the only competitive advantage on the market. Will Lukashenka follow Jaruzelski’s steps? – Aliaksandr Klaskoŭski follows up on a recent meeting between Lukashenka and Iosif Siaredzič, chief editor of Narodnaja Volia independent newspaper. The author concludes that the crisis in Belarus is not as acute as it was in Poland in late 1980s to make Belarusian leadership hurry up with the national dialogue, while Belarusian opposition and civil society should get out of the political ghetto to make the roundtable meaningful. 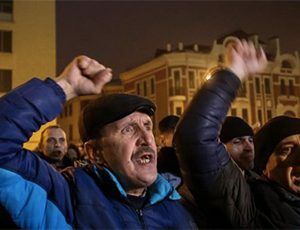 A Belarusian Balancing Act – Thomas De Waal, Carnegie Europe, notes that unprecedented series of street protests in several towns over the weekend of February 18–19, inspired by socioeconomic grievances, suggests that Alexander Lukashenka knows his regime needs to keep adapting if it is not to crumble. Lukashenka tries to keep his options open with the EU while not allowing Russia to take him for granted. Situation In the Field of National Security and Defense of Belarus. January 2017 – According to Belarus Security Blog monthly monitoring, a new reality in the field of border security Belarus is the fact that starting from August 2016 Russia de facto withdrew from the regime of freedom of movement across the border with Belarus. The depth of the contradictions between the two countries makes real the prospect of a full-fledged return of border controls on the Belarusian-Russian border. Civic Literacy Test in Belarus: High Basic Knowledge, Low Trust in Influencing Government – According to the Civic Literacy Test, the first national survey of the kind in Belarus, 75% of Belarusians have high knowledge of basic civil rights and responsibilities; at the same time, 99% believe they cannot influence state policies and decisions. The national survey was conducted by SATIO and commissioned by Pact in June 2016. The presentation will take place on March 15 in Minsk. P.S. Zhadan. Catching poet-"terrorist" – Maksim Žbankoŭ, Belarusian Journal, reflects on a case of the detention in Minsk, the deportation decision and its cancellation of the famous Ukrainian writer Serhiy Zhadan. The analyst sees a clear message in that – the authorities have no logic, only emotions and instincts. One more conclusion is that a person in Belarus is totally unprotected before the authorities. Work of the High Technology Park: a threefold increase in exports of IT services and what would happen if the park is closed. The results of statistical modeling that involves the method of synthetic monitoring for assessing the impact of High Technology Park on the growth of IT sector show that the creation of the park led to a threefold increase in exports of IT services in Belarus during 2006-2013. However, top managers of Belarusian companies are afraid of changes in the Park's legal environments and predict migration of IT companies in other countries, spread of semi-legal schemes of work and an overall reduction in the rates of IT sector development. The anatomy of Belarusian joint stock companies. Little is known about how effective the Belarusian enterprises are, what share of the economy belongs to the state, how state-owned enterprises differ from private ones, how labour, capital and materials are distributed between the companies, and how emergence, evolution and exit of enterprises from the market impacts the economy. This work is an attempt to find answers to these questions by analysing the activities of the Belarusian joint stock companies. 8th issue of the Macroeconomic Review of Belarus (IV quarter 2016). Quarterly issues of the Macroeconomic Review of Belarus represent the unique panorama in over 100 graphs and tables of the key economic indicators covering all sectors of Belarusian economy: real sector, fiscal sector, monetary sector, and external sector. There are less words, more data. Macroeconomic Review can be helpful for a wide range of local and external stakeholders interested in Belarus economy in general: from academia and public authorities to representatives of international organisations.